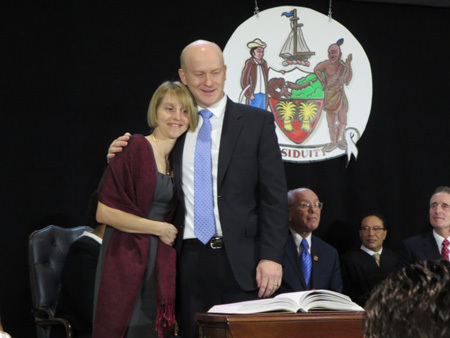 On New Year’s Day The Wife and I made a very special point of attending the inauguration of our new mayor, Kathy Sheehan, of the Treasurer, Auditor and Common Council president and of the fifteen members of the Common Council. Seven of those Council members are newly elected freshmen, several of whom had defeated incumbents. We’ve been waiting for this day for a long time, indeed The Wife was practically hopping up and down for the past week in anticipation. No way we were going to miss this. 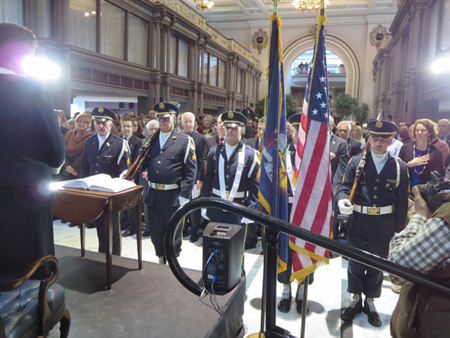 Because of anticipated unprecedented attendance, the inauguration was moved at the last minute from City Hall to Kiernan Plaza at 575 Broadway. We had never been inside this incredibly beautiful historic building which used to be the Albany train station, called Albany Union Station. At its peak in the mid-twentieth century it received 121 trains per day. The station was decommissioned in 1968 when the passenger trains were foolishly relocated across the river, since then the building has been woefully underused. The Inauguration was scheduled to begin at 10:30 AM, so we decided to get there early and arrived at quarter to ten. But the damn doors were locked, so we joined the crowd of mere citizens stamping their feet in the cold and complaining, some bitterly. While we waited several participants in the ceremony arrived and several people in the crowd told them to enter by the side door around the corner. At 10 AM they finally let us in, and what a magnificent interior. Like, jaw dropping. 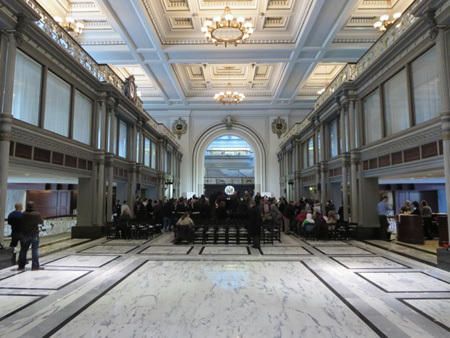 The center of the building is open and rises up three stories or so, with marble floors and glass-enclosed balconies and gilded decorations and big mechanical clocks and giant chandeliers. Undoubtedly this was the main waiting area for trains. Because of our early arrival The Wife was able to grab us some good seats (which, as she predicted, I did not use) in the middle of the sitting area in front of the media platform. Soon plenty more seats were set up in back, but still weren’t enough for all the attendees and a good sized crowd stood in back and on the sides. After the ceremony started I looked back and noticed that almost the entire gigantic hall was filled with people. By the way, there was no obvious visible security other than honor guards, no unconstitutional checkpoints and searches like we’ve had to put up with at City Hall since 1999, no cops scowling at the crowd. It would have been a great opportunity for Al Qaida or some teabagger to massacre the local government, but the terrorists must have gotten the date wrong and didn’t show up. 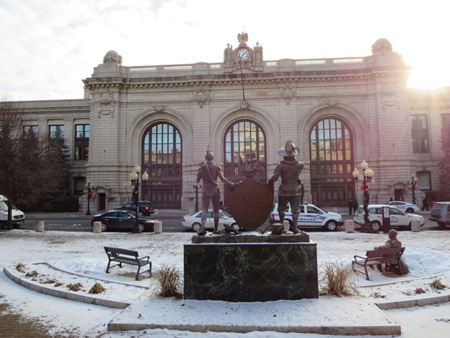 I hope we see the bogus Security Theater withdrawn from our taxpayer-funded City Hall in the coming months. 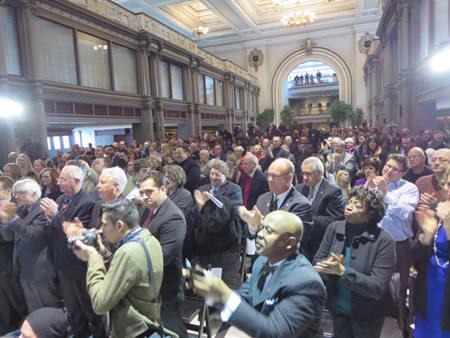 Our Congressional representative Paul Tonko was the master of ceremonies, a job he handled skillfully and with ease. 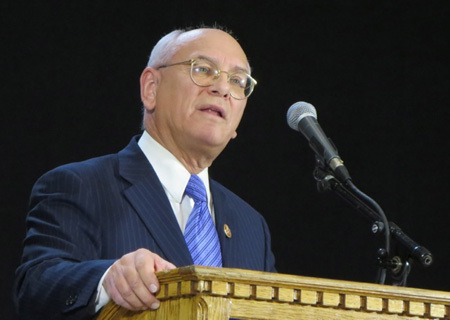 In an era when the typical Congress creature is a blithering corporate whore, Mr. Tonko stands out for his integrity and his straightforward manner, and also for his ability to declaim passionately and convincingly on the important social issues which affect his constituents. 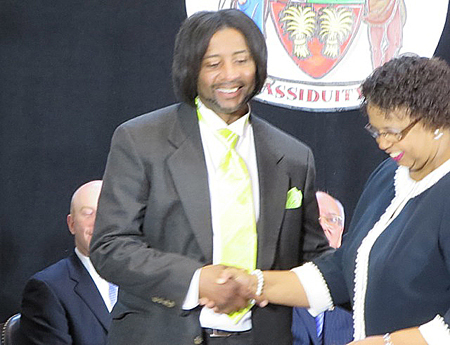 He was an excellent choice to lead the ceremony, and the respect for him by the participants was evident. But first the American Legion of North Albany brought in the US flag and the NY State flag, and the Pledge of Allegiance was recited, led by the City of Albany Girl Scouts. Of course the entire crowd stood at attention and the most proper decorum was observed by all. I’m always fascinated by such rituals, this was an extraordinary example of heartfelt public devotion. Next a young lady from Albany named Arielle King sang the national anthem, and holy cow she was good. More often than not at these sorts of things somebody massacres the awful tune and everybody tries not to wince, but this time everyone I talked to or that I overheard agreed that she was fabulous. While she sang I was delighted by some of her phrasings of the tired old lines and of her ease of execution, beautiful. You’ll be hearing more of Arielle King and her singing, remember you read it here first. After the invocation by Reverend Dr. Damone Johnson of Metropolitan Baptist Church in the Arbor Hill neighborhood, we got down to business. 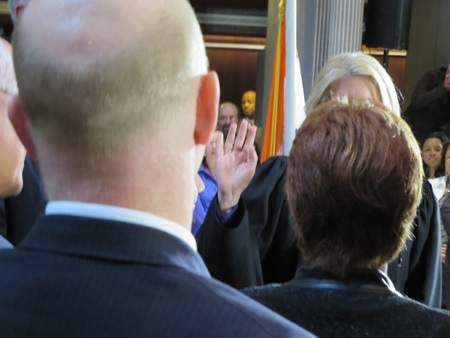 Carolyn McLaughlin was sworn in as Common Council president by Judge Randall Treece. Ms. McLaughlin received a respectful standing ovation after being sworn in for the mostly ceremonial but influential post. 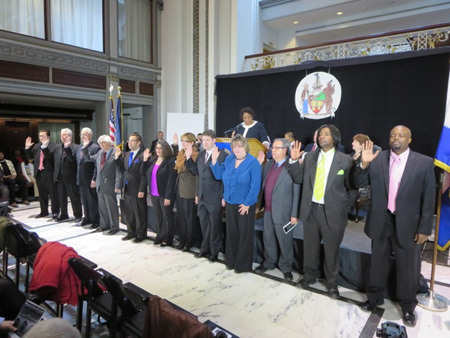 Next the Common Council members were sworn in en masse by Ms. McLaughlin. Realizing that my little camera was not catching three members on the end, including the two members most important to me, I quickly repositioned myself and managed to catch our newly elected 1st Ward member Dorcey Applyrs, and most importantly our own new 2nd Ward member Vivian Kornegay. Both looked like they were praying. Ms. Kornegay and Ms. Applyrs were two of the seven new members, both won hard bitter Primary campaigns this past September to be here today. Ms. Applyrs’ won a surprisingly close three-way battle to take retiring Dominick Calsolaro’s seat, and Ms. Kornegay edged out a hard and nasty fight against an incumbent by a mere 19 votes. An incumbent, I should add, that almost everyone was glad to see gone. A word about Dominick. For twelve years he was the advocate of good government and fiscal responsibility, at first the only member of the Council to do so. As such he was outgoing mayor Jerry Jennings‘ nemesis, His political opposite, and in this role Mr. Calsolaro had to take a lot of abuse from Jennings and His minions. Back at the beginning of this century no one was supposed to mention in public serious problems such as the vacant building crisis, the decaying tax base caused by political corruption, the fiscal and environmental nightmare Rapp Road Dump, civil liberties and inequality to name a few, not to mention more mundane issues such as sidewalk repair and snow removal in the neighborhoods. Now thanks to Dominick all of these are visible and on the table. So I guess it’s fitting that Dominick go out the door with Jerry Jennings, but it sure was strange to see him sitting in the audience like the rest of us mere taxpayers. But what about Jerry? 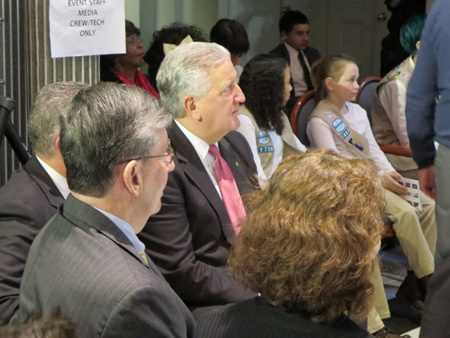 The now former mayor of Albany sat off to the side with the Girl Scouts and our State representatives (Senator Breslin, Assembly members McDonald and Fahy) as part of the dignitaries who congratulated the newly sworn-in as they stepped off the stage. Several times I glanced over and saw that He looked more than pensive, He looked downright sad. I can only speculate about what thoughts were running through His head as He sat there watching the City pass out of His hands. 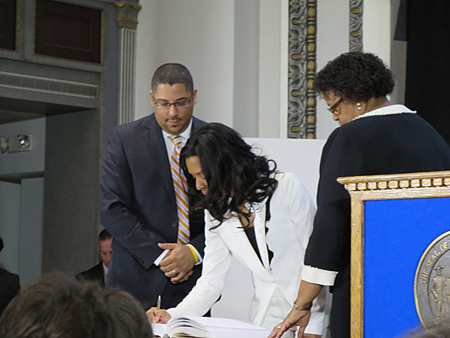 It was time for the inaugurated Common Council members to sign The Book, the quaintly old fashioned official register of elected officials. 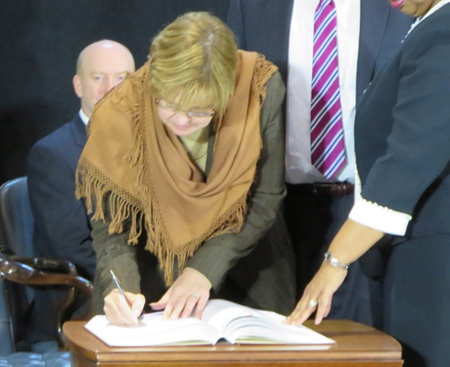 In past years Jennings jealously guarded The Book during inaugurations, literally holding it as the newly inaugurated elected official signed. 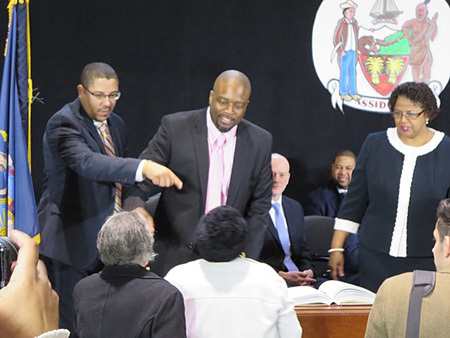 In this way the former mayor symbolically conveyed power to the signing official, sort of like the transmission of grace by a priest. The Common Council members signed in order, beginning with Dorcey Applyrs in the 1st Ward, and Vivian Kornegay of the 2nd after her. I’m only showing photos of the new members here. It’s the nature of elective politics that strange opposites often sit together, that is, when elective politics works like it’s supposed to. In the 4th Ward former Albany police officer Kelly Kimbrough easily captured the seat held by retiring Barbara Smith, who endorsed him early on. I’m told that Mr. Kimbrough, a rare Albany officer who lives in the neighborhood that he patrolled, has always been popular and well regarded by the voters, this in a part of town where the police are particularly regarded with suspicion. Next door in the 5th Ward Mark Robinson was the winner in a four way Primary race that included the incumbent, who came in third. Mr. Robinson’s victory was greeted with horror by many outside of the 5th, he was once known as a notorious drug lord, part of a family that, among other things, operated a crack house on Elizabeth Street in the South End during the era of police denial of service. He was convicted of felonious sale of marijuana, served a stiff sentence in prison and was released early on good behavior, having served his time. After release he turned to renovating vacant buildings in his old neighborhood, and has reportedly become a well-liked and respectable citizen. He can be rather elusive, several times I’ve tried to approach him at political functions to ask for an interview, and at this one he again disappeared before I could catch him. I’ll try again in a month or so. Meanwhile, for the next four years he will be seated next to former police officer Kimbrough in the Common Council chambers, which may be interesting. Hardly anyone seems to know much about Jack Flynn, who handily captured the 8th Ward seat vacated by John Rosenzweig. Mr. Flynn was the Democratic Party deputy ward leader under Rosenzweig, so he is not considered by most as a reformer or as an independent minded representative. But who knows? The only other thing I know about him is that he works as an “election education specialist” at the Albany County Board of Elections. 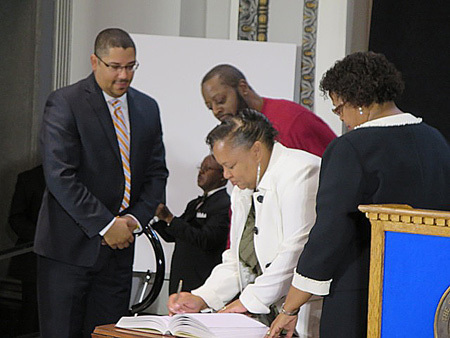 Former schools board member Judy Doesschate is the new representative for the 9th Ward. 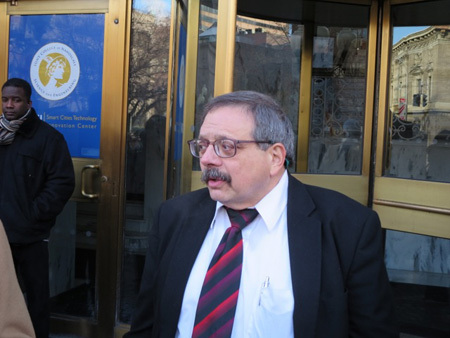 I had a chance at the end of the ceremony to ask retiring Council member James Sano why he waited until three days before the end of the petitioning period to announce that he did not intend to run. He told me that it was because certain of his family members who are in extreme bad health made him reluctantly decide at the last minute to withdraw. His action irritated a lot of people who thought Mr. Sano was attempting to guarantee his seat to Ms. Doesschate’s opponent. It was a frantic three days for Ms. Doesschate collecting signatures, but she prevailed in the Primary by a large margin. Judd Krasher absolutely hammered his incumbent opponent in the Primary, which shocked a lot of people who thought it would be close. In retrospect those shocked people should have realized that Mr. Krasher has a lot of behind the scenes experience running winning campaigns which he applied expertly to unseating a controversial and thus vulnerable incumbent. 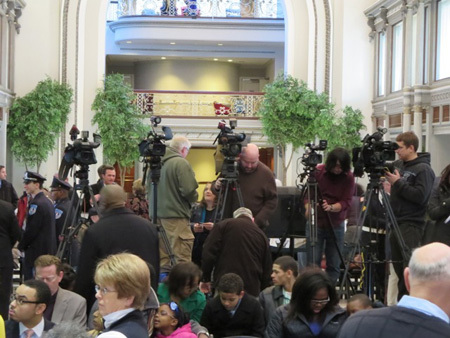 But during the Primary campaign he gave the strong impression that he intended to represent his 11th Ward rather than push his own agenda, which the voters responded to eagerly. And now it was time for the rest of the City wide officials to swear, the first being the City’s first Auditor Leif Engstrom, beginning his second term. Now, we are still not too sure exactly what the Auditor is supposed to do, after one term the job is still begging for definition. What we do know is that the auditor is supposed to issue reports on City finances and resources, and Mr. Engstrom is the person who is writing reports and defining the job. Perhaps now with a new mayor he will be able to do that with greater effect. Mr. Engstrom, true to form, gave a long speech about the condition of City finances that left a lot of people stunned, partly because it was such a long speech but mostly because it was very critical of the City’s financial condition. “Controversial” was the word I heard. Jerry had to sit there and listen to Mr. Engstrom pretty much condemn the financial practices of His 20 year administration. Even if the major problems are quickly resolved, said Mr. Engstrom, “Our City will still face infrastructure needs greater than our tax base can support.” He then got big applause when he said that the solution was that a greater share of our taxes must be returned to the City from the State and from the Feds. Mr. Engstrom also emphasized his independence from other City officials, that autonomy was critical to his job. Our new Treasurer Darius Shahinfar gave a shorter speech, it has always been his position that the key to solving the City’s financial crisis is to encourage growth of business in the City. Of course the total solution is a combination of both. 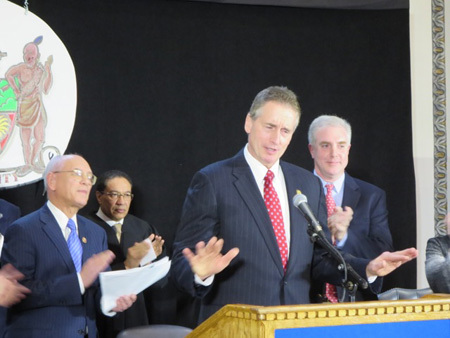 Albany needs to be subsidized at the same rate as the surrounding suburbs, and we need to foster business growth, AND we need to provide attractive housing so that taxpayers will want to live and pay taxes in the community where they work. All three of these ideas found synthesis about twenty minutes later in Kathy Sheehan’s post inaugural speech. Indeed, Mr. Engstrom, Mr. Shahinfar and Ms. Sheehan entered the political scene as allies. Of course, four years ago Mr. Shahinfar and Mr. Engstrom fought a close Primary race to be the first Auditor, but now Mr. Shahinfar has found his position and there is absolutely no bad blood between them. 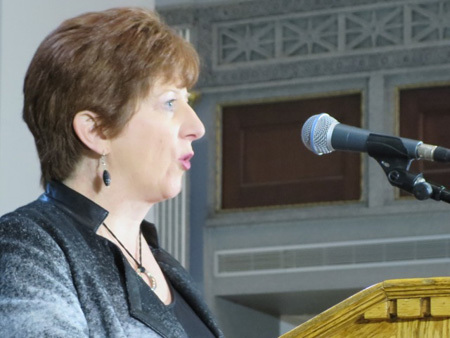 And it should be mentioned that Albany County Family Court Judge Margaret Walsh swore in all three officials, a sign of personal cooperation between all three. Andrew Cuomo is a hard-line corporatist, imposing corporate run casinos on the State, turning the areas around colleges into tax-free zones but only for corporations, funneling cash and favors to large corporations and financial parasites, etc. But he is also a very astute politician. So it is interesting that he made a point to attend the inauguration of a NYC mayor who swept into office on a campaign promise to tax the rich and hold corporate predators to account for their crimes. 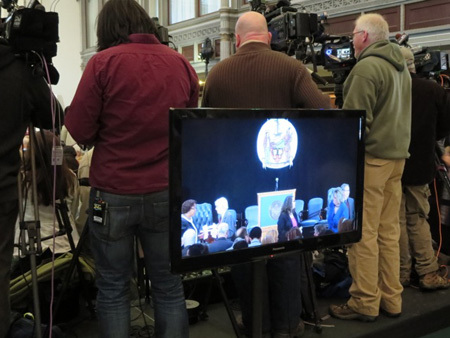 It is also interesting that he sent the State’s number two Mr. Duffy to attend the inauguration of Kathy Sheehan, perhaps this is a sign of respect from the Governor for the new mayor. The mayor of Albany and the Governor have always had a special relationship, for no other reason than that they can both sit in their respective offices and practically spit on each other. As the Occupy encampment in the Autumn of 2011 demonstrated dramatically, City Hall and the Capital are intertwined. But we will soon learn how well Ms. Sheehan handles that relationship. 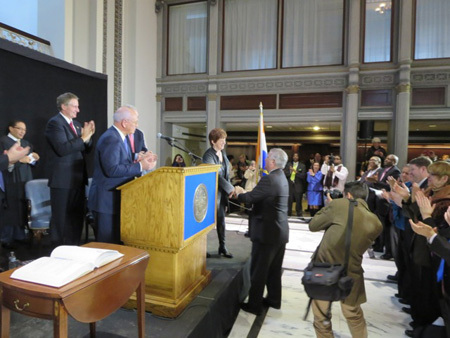 After Mr. Tonko delivered a rousing ovation to introduce the new mayor, and as Ms. Sheehan rose from her seat to the podium the entire hall stood and applauded. 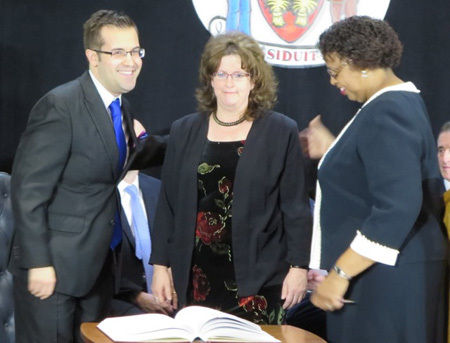 Much has been made of the fact that she is the City’s first female mayor, but I swear Ms. Sheehan has got to be the shortest mayor this City has had since the Dutch planted Fort Orange in the South End mud in 1609. When crowds press in around her she absolutely disappears from view. In those intense few moments when Judge Walsh administered the oath of office I just couldn’t get a decent photo. The people on the stage pressed in and suddenly I was getting elbowed by all sorts of people with cameras. I tried to maneuver but all I could photograph was some backs of heads. As we begin 2014, our structural deficit stands at more than $16 million and our rainy day fund will be depleted by the end of the year. Vacant, blighted and abandoned buildings mar far too many of our once vibrant, diverse and historic neighborhoods. One in four of our residents live at or below the poverty level, and many more struggle to support their families. And property taxes are so high that many families and businesses simply cannot afford to locate here. I glanced over at Jerry Jennings as the new mayor spoke this part. He had a profoundly sad expression on His face, and for a moment He looked old again like He did last Spring before He announced that He was not running again. I decided to not try to snap a picture of Him at that moment. At the end of the speech I’d been crouching in front taking photos along with Willie White, another neighborhood activist who, like me, caused the former mayor plenty of irritation. Suddenly I heard a familiar growl and sure enough Jerry pushed Willie and I apart as He strode up to the stage to give His personal congratulations to Ms. Sheehan, a moment that was not on the program. 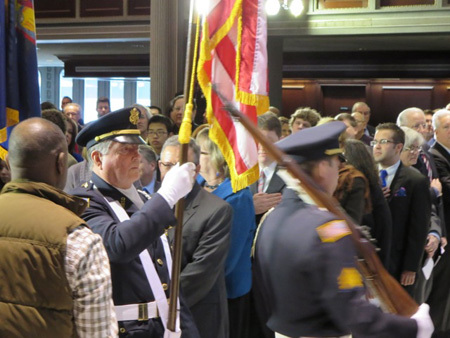 So the American Legion Color Guard marched in and collected the flags, which was the end of the ceremony. It was an impressive and well-executed event, nothing went wrong as far as I could see. 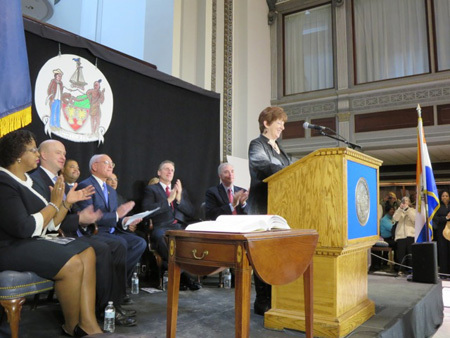 If the ease and passion of this inauguration is an indication of what we can expect from our new government, then I think we can look forward to better for Albany in the next few years. 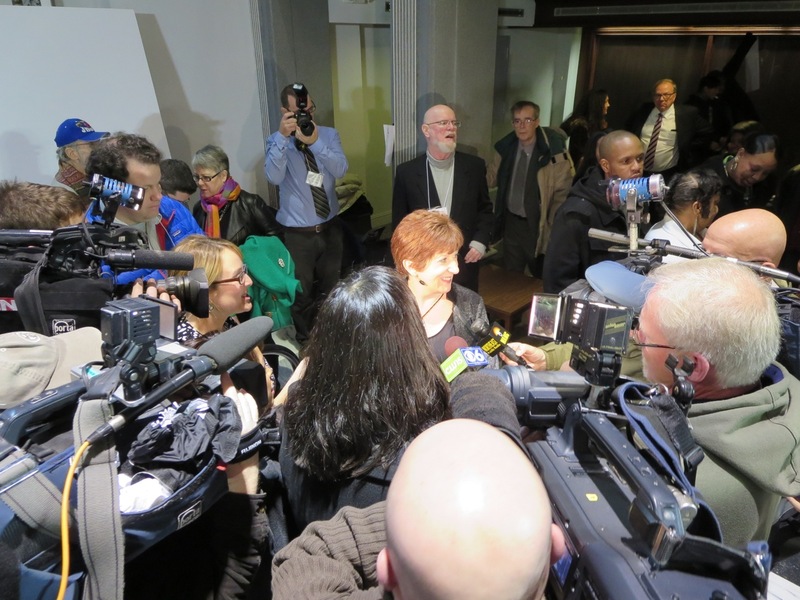 About a week later I found myself along with several other people chatting with mayor Kathy Sheehan in the kitchen of a home in the South End. I was struck by her lack of bravado, I mean, most other politicians after such such triumphant ego stroking would be preening and posing like a rooster. She looked a bit stunned and a bit tired standing next to the counters talking with a few of her supporters, but no fuss, no demanding attention. The funny thing was that it was an awkward situation with conversational silences. Here she was with familiar folks who’ve been helping her out since she was a nobody running for Treasurer, and suddenly her friends didn’t know how to talk to her! Now she was the most powerful politician in the City, it was like these normally garrulous people were afraid of saying the wrong thing to this strange new creature. 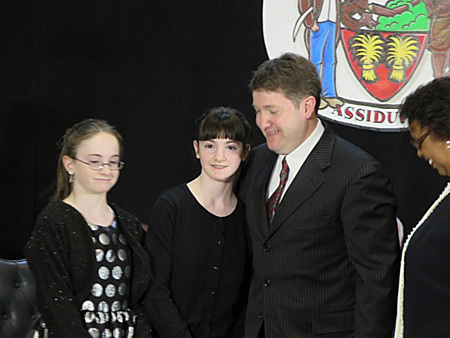 Later I realized that this odd moment of awkwardness reflected what might turn out to be a fundamental image problem that the new mayor will have to face. 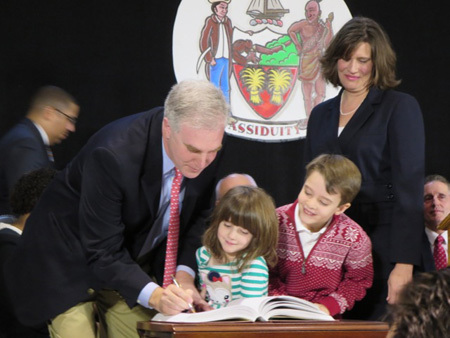 Up until now every mayor, certainly within living memory, has been a patronizing father figure, an image that Ms. Sheehan clearly does not wish to assume, even if she was capable of doing so. I seriously wonder if Ms. Sheehan has considered this possible image problem and has a plan to deal with it. 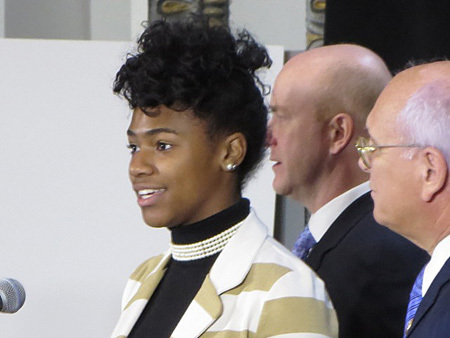 According to a Siena Poll taken last summer, majorities of voters asked about separate issues decried the condition of Albany after 20 years of Jennings. And yet, 71 percent had a favorable view of Jennings Himself. Over the years I have heard some of Jennings’ harshest critics sheepishly confess that they have been known to vote for the man. Indeed, after all that He has done to undermine The Wife and myself and our neighborhood, and after all the things I’ve said about Him on this blog, He and I got along just fine when we met in public. Most of the time. I’ve observed that people usually don’t give conscious thought to such things, but if people’s unspoken expectations don’t get fulfilled they tend to get upset. And upset people often act out. I’m rather worried that a significant number of people in this City will have a knee-jerk negative attitude toward our short, female mayor with a casual manner and a tendency to not attract attention for its own sake. They want a dominating daddy, and if they don’t get one they may throw tantrums. 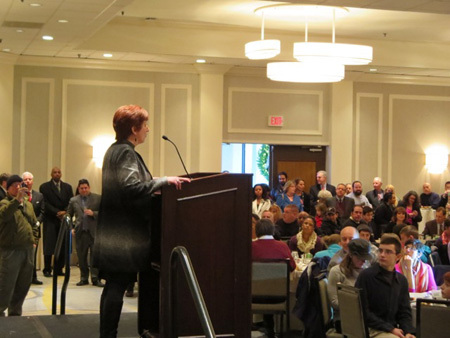 One thing I learned in that South End kitchen is that after a week that included a major snowstorm, Kathy Sheehan is not one bit fazed by the challenges that she faces. A few months ago she told me proudly that she was a workaholic, and in the kitchen she talked about how as Treasurer she expected her employees to work hard and work efficiently. 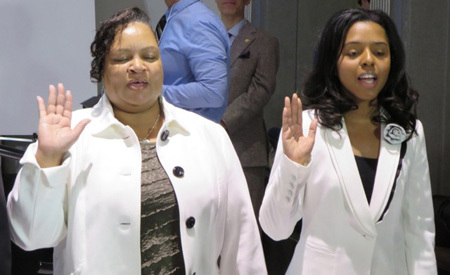 Apparently word is out that she does not tolerate laziness, that may be part of the reason why so many top officials in City Hall have decided to retire with Jennings. We will see how confident she is in six months or a year. I am observing that Kathy Sheehan does not come to the job of mayor with stars in her eyes or an overblown ego, and clearly she is financially comfortable enough that she does not have to engage in kleptocracy. 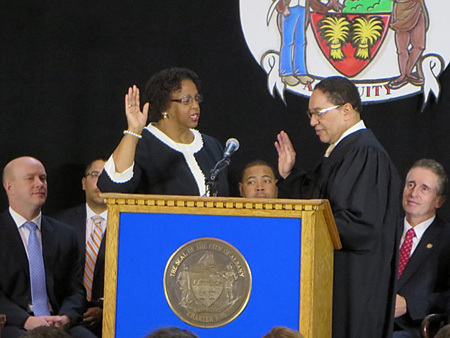 We have high hopes for her, and because of her we have high hopes for our City. But like I said, we’ll see.